Inhalation of toxic gases is dangerous to humans; experiments using toxic gases themselves are also hazardous to researchers. Gas-releasing molecules are widely used as alternatives to toxic gases, but their impacts on the whole body remain to be examined. To investigate responses during hydrogen sulfide (H2S) poisoning, rats (Sprague-Dawley, male, 8-week-old) were intraperitoneally (i.p.) administered H2S donor, NaHS, and sacrificed 24 hr after the administration. The main histopathological finding commonly observed in NaHS-administered rat heart, liver, brain, and lung was congestion. In addition, inflammation and accumulation of mucopolysaccharides were observed in bronchioles of the lung. Immunoblot analysis indicated increasing trend of NF-κB activation, and real-time PCR analysis showed increasing tendency of TNFα and IL-1β, as well as MUC1 and 5B, in NaHS-administered rat lung. Immunohistochemistry by use of anti-MUC1 and 5B antibodies confirmed enhanced mucosal secretion from bronchial epithelium. Moreover, administration of TNFα or IL-1β to A549 lung epithelial cells resulted with enhanced expressions of MUC1 and 5B. This report shows bronchitis and respiratory mucosal secretion in animal model of H2S intoxication, which is created by i.p. administration of a H2S donor, through NF-κB-TNFα/IL-1β-ΜUC1/5B pathway. Hydrogen sulfide (H2S) is a gas generated in volcano and hot spring districts, and from spoilage microorganisms in lakes, marshes, and sewage (Reiffenstein et al., 1992). Like cyanide, sulfides have potent inhibitory effect on cytochrome c oxidase in complex IV of mitochondrial respiratory chain (Nicholls et al., 2013). Therefore, H2S is a highly toxic gas and inhalation of 500-1000 ppm H2S gas results in immediate death of humans (Doujaiji and Al-Tawfiq, 2010). Breathing H2S gas irritates respiratory tracts and finally causes injuries of airway and lung (Reiffenstein et al., 1992). In addition to toxic nature, H2S is also generated in human bodies through the reaction of several enzymes such as cystathionine β-synthase and play pivotal roles in human homeostasis through vasoregulation or other regulation (Wang, 2012). These injuries include bronchitis and pulmonary edema, and could lead to chronic obstacle pulmonary diseases (COPD) after long duration of H2S intoxication (Reiffenstein et al., 1992; Jiang et al., 2016; Tanaka et al., 1999). Respiratory secretions such as mucosal secretions play important roles against these lung injuries (Rogers, 2007). Mucins (MUCs) are proteins that serve as core backbone of glycoproteins consisting mucosal surface in respiratory tracts. Mucins are secreted from respiratory tract such as airway epithelium and submucosal gland (Rose and Voynow, 2006; Jeffery and Li, 1997). There are two types of mucin; MUC1 is a membrane-tethered mucin that forms lining fluid over airways while MUC5AC and 5B are gel-forming polymeric mucins that forms gel over the fluids (Thornton et al., 2008). It has been reported that MUC1 and MUC5B expressions are regulated by TNFα and IL-1β, respectively, in airway epithelial cells (Fujisawa et al., 2011; Choi et al., 2011). Enhanced respiratory secretion of mucin is required for clearance of toxic substances, bacterium, and viruses, but excessive secretion leads to airway occlusion, impairs pulmonary functions, and finally causes COPD (Rose and Voynow, 2006; Adler et al., 2013; Fahy and Dickey, 2010). Since H2S gas is highly toxic to humans and easily diffuses into laboratory atmosphere, experiments using H2S gas itself should be performed with extra cautions. As an alternative to inhalation and intratracheal instillation of gases, systemic administration of several H2S donors, such as inorganic NaHS and recently developed synthetic GYY4137 (Li et al., 2008), have been adopted by researchers. Although it has been demonstrated that a H2S donor, NaHS, causes inflammation of the lung when being administered i.p. to animals (Bhatia et al., 2006), effects on respiratory secretions remain to be examined. The aim of this study is to evaluate responses of pulmonary tissues in rats systemically administered H2S donor. Sprague-Dawley rats (male, 8-weeks-old, n = 4 or 5/group) were received single intraperitoneal injection (i.p.) of NaHS (5 mg/mL solution prepared in PBS, pH 7.4) at a dose of 10 mg/kg body weight. Since IC50 of NaHS is around 20 mg/kg body weight in rats and i.p. administration of 20 mg/kg body weight NaHS has been shown to induce rapid coma in one third of rats, we adopted a lower dose to avoid possible death of animals (Sonobe et al., 2015; Warenycia et al., 1989). Control group rats received the same volume of PBS. Twenty-four hours after the injection, rats were sacrificed and the heart, liver, brain, and lung tissues were excised. Hematoxylin and Eosin (H&E) stain was performed as described previously (Unuma et al., 2013). The percentages of degenerating neurons were determined as follows: in each H&E stained slide, approx. one hundred neurons were counted in 3 different fields within the cortex and the average of degenerating neurons was determined for each slide. Periodic acid-Schiff (PAS) stain was performed under standard procedure and counterstained in hematoxylin reagent. For immunohistochemistry, the tissue sections were incubated with anti-MUC1 (Abcam, Cambridge, MA, USA), -MUC5B (GeneTex, Irvine, CA, USA), and -E-cadherin (BD Bioscience, San Jose, CA, USA) antibodies, followed by visualization of antigens by use of VECTASTAIN (Vector Laboratories, Burlingame, CA, USA) using diaminobenzidine (DAB) as a substrate. For immunoblot analysis, lungs were homogenized with STE buffer [320 mM sucrose, 10 mM Tris-HCl (pH 7.4), 1 mM EDTA, 50 mM NaF, 1 mM Na3VO4, and Complete Protease Inhibitor Cocktail (Roche Diagnostics, Mannheim, Germany)]. Immunoblot analysis was performed with anti-phospho-NF-κB p65 (Ser536) (Cell Signaling Technology, Beverly, MA, USA), anti-E-cadherin (BD Bioscience) and -actin (Sigma-Aldrich, St Louis, MO, USA) antibodies. Antigens were visualized by use of peroxidase-conjugated anti-IgG antibodies (Promega, Madison, WI, USA) and a Western Lightning Chemiluminescence Reagent Plus Kit (PerkinElmer Life Sciences, Boston, MA, USA). Real time reverse transcriptase-mediated PCR (real time RT-PCR) analysis was performed as described previously (Okawa et al., 2015; Unuma et al., 2017). Primers used are shown in Table 1. A549 human alveolar epithelial cells were maintained in DMEM supplemented with 10% FBS and antibiotics. NaHS was applied to the cells at a final concentration of 1 mM as described previously (Fujii et al., 2016). TNFα (mouse, recombinant, Sigma-Aldrich) and IL-1β (human, recombinant, Sigma-Aldrich) were applied to the cells at 50 ng/mL and 10 ng/mL, respectively. LDH release was determined using LDH-Cytotoxic test (Wako Pure Chemicals, Osaka, Japan). For statistical analysis, Student’s t-test was used throughout the experiments. GraphPad Instat (Version 3.1a, GraphPad Software, Inc., La Jolla, CA, USA) was used for this purpose. 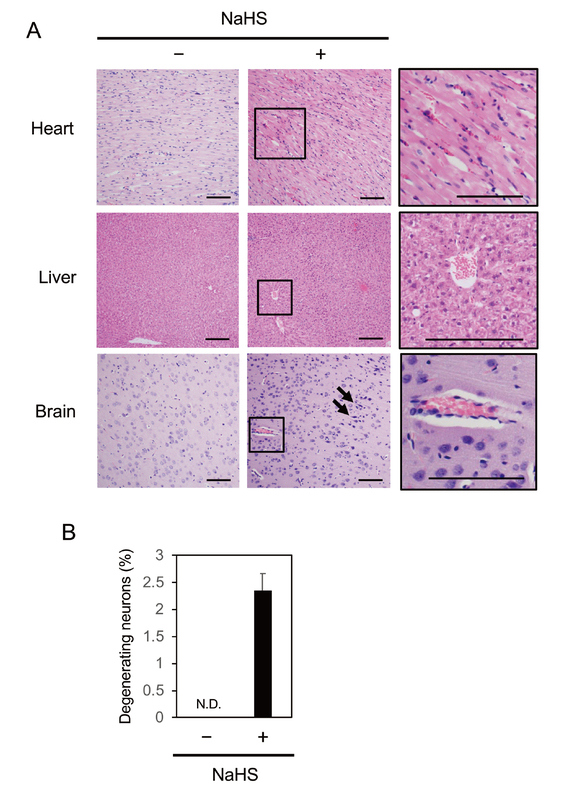 In NaHS-administered rat heart, liver, and brain, congestion of the vessels was observed (Fig. 1A). In addition to congestion, degenerating neurons were observed slightly but significantly in NaHS-administered rat brain (Fig. 1B). Taken together, the most frequently observed pathological finding common to NaHS-administered rat heart, liver, and brain was congestion. Additional observation of slight neuronal degeneration in the brain could be related to coma, which is reportedly observed in in the brain of rats administered NaHS at a higher dose (20 mg/kg body weight) (Sonobe et al., 2015). In contrast to these tissues, neutrophil infiltration was observed in both airways and vessels of NaHS-administered rat lung (Fig. 2A). Along with neutrophils, several vessels were filled with red blood cells, indicating congestion of the lung (Fig. 2A). Occurrence of red blood cells was also observed in some bronchioles, suggesting hemorrhage in airways (Fig. 2A). In airways of NaHS-administered rat lung, secretion of respiratory tract was also observed in several bronchioles (Fig. 2A). Enhanced secretion in the airway of NaHS-administered rat lung was indicated by PAS stain (Fig. 2B). Activation of NF-κB, key transcription factor mediating the expression of inflammatory cytokine genes, was indicated by increasing tendency of Ser583 phophorylation of p65 subunit (Fig. 2C). Real time RT-PCR analysis showed significant increase of TNFα expression, as well as trend of increase in IL-1β expression, in NaHS-administered rat lung (Fig. 2D). Collectively, these results suggest inflammation and congestion in the vessels, as well as inflammation and respiratory secretion in the airways, of NaHS-administered rat lung. H&E stain of rat heart, liver, and brain tissues from rats administered NaHS. (A) Congestion was observed in all of these tissues after administration of NaHS (10 mg/kg body weight). Arrows indicate degenerating neurons observed in the frontal cortex of NaHS-administered rat brain. Rightmost images are enlarged images of the sites of congestion (boxed areas) observed in NaHS-administered rat tissues. Black bars, 100 µm. (B) Percentages of the degenerating neurons observed in the rat brain. N.D. indicates Not Detected. 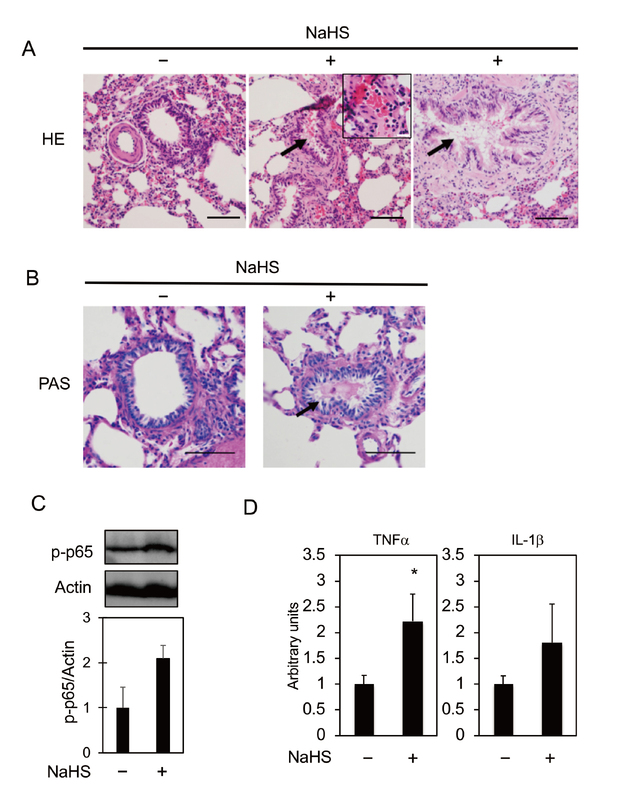 Respiratory secretion and inflammation in the lung of NaHS-administered rats. (A) H&E stain of rat lung tissues. None was observed in the vessels and bronchioles in PBS-administered rat lung (left panel). Secretion, congestion, and neutrophil infiltration were observed in the bronchioles and vessels in NaHS (10 mg/kg body weight)-administered rat lung (middle and right panels). Arrows indicate respiratory secretion in bronchial tubes. Inset image in middle panel shows a congested and infiltrated vessel. Black bars, 100 µm. White bar (inset), 30 µm. (B) PAS stain of rat lung tissues. Arrow indicates respiratory secretion positive to PAS stain. Black bars, 100 µm. (C) Immunoblot analysis of Ser583 phophorylated p65 subunit of NF-κB (p-p65) in rat lung. Relative levels of p-p65 to actin are shown. n = 4 in each group. (D) RT-PCR analysis of rat lung tissues. Relative levels of TNFα and IL-1β to GAPDH (arbitrary units) are shown. n = 4 or 5 in each group. *; p < 0.05 versus -NaHS. It is well-known that hydrogen sulfide causes mucosal irritation which leads to enhanced secretion of mucosa (Mooyaart et al., 2016). To confirm enhanced mucosal secretion from respiratory tract, we examined expression of MUC1, 2, 4, 5AC and 5B genes in the rat lung, and observed detectable expression of MUC1 and 5B in our experimental settings. Significant increase of MUC1 and tendency for increase of MUC5B were demonstrated in NaHS-administered rat lung (Fig. 3A). To further confirm the enhanced secretion of mucopolysaccharides, including mucin, immunohistochemistry by use of anti-MUC1 and -MUC5B antibodies was examined. In the lung from control group rats, both of these antibodies mainly stain epithelial cells in bronchioles (Fig. 3B). Respiratory secretion products were also stained by both antibodies (Fig. 3B). Airway mucins play central roles in the protection of the lung through clearance of inhaled toxic substances (Johnson, 2011). MUC5B is believed to be especially important to maintain lung homeostasis, as MUC5B deficiency in mice results in the prolonged inflammation after bacterial infection in the airways (Roy et al., 2014). Thus, enhanced mucosal secretion along with inflammation in the airway should be involved in the protection of lung homeostasis against respiratory tract irritation by NaHS. On the other hand, excessive secretion of mucosal often leads to airway blockage, alveolar dysfunction, and subsequent development of COPD. However, the airway as well as alveolar epithelium seemed not to be injured as judged by immunostain and immunoblot analysis of E-cadherin, which is responsible for cell-cell adhesion of epithelial cells in respiratory tract (Fig. 3C and D). Expression of mucins and E-cadherin in the lung of NaHS-administered rats. (A) RT-PCR analysis of lung tissues from rats administered NaHS (10 mg/kg body weight). Relative levels of MUC1 and MUC5B to GAPDH (arbitrary units) are shown. n = 4 or 5 in each group. **; p < 0.01 versus -NaHS. (B) Immunohistochemistry of MUC1 and MUC5B. Upper panels, immunohistochemical analysis of MUC1. MUC1 is localized to airway epithelial cells. In the airway of NaHS (10 mg/kg body weight)-administered rat lung, respiratory secretion was also stained with anti-MUC1 antibody. Lower panels, MUC5B-positive cells were mainly observed in airway epithelium, and respiratory secretion was also stained with anti-MUC5B antibody. Bars, 100 µm. (C) Immunoblot analysis of E-cadherin in rat lung. Relative levels of E-cadherin to actin are shown. n = 4 or 5 in each group. (D) Immunohistochemistry of E-cadherin. Strong stain was observed in adhesion junction between airway epithelial cells in both NaHS and vehicle groups Bars, 100 µm. Finally, transcriptional responses of pulmonary epithelium to the stimulation by NaHS were examined in vitro. We adopted 1 mM NaHS since this concentration of NaHS was not toxic to other lung-derived cells (Fujii et al., 2016). Indeed, we did not observe any cytotoxicity in A549 cells 4 days after the administration of 1 mM NaHS (Fig. 4A). 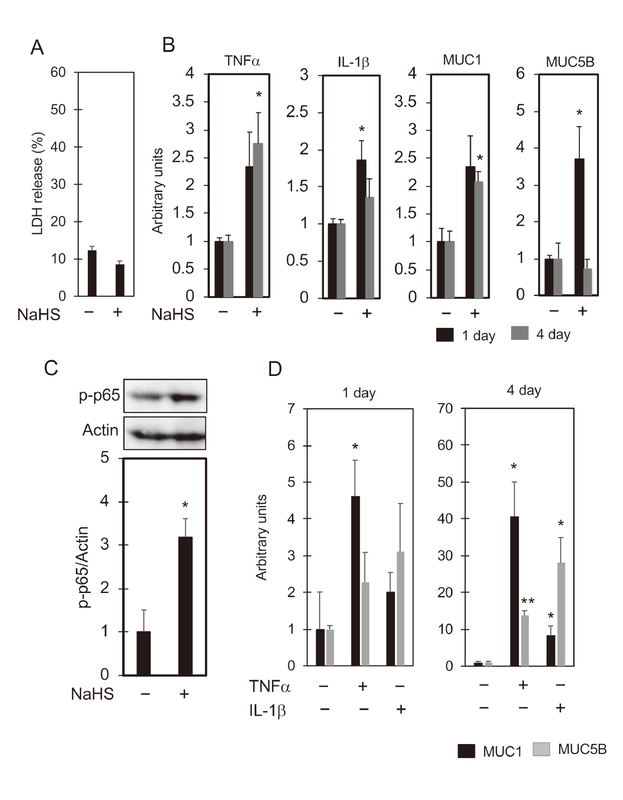 Administration of this sub-lethal concentration (1 mM) of NaHS to A549 human pulmonary epithelial cells for 1-4 days resulted in significant upregulation of TNFα, IL-1β, MUC1, and 5B gene expressions (Fig. 4B). One day after 1 mM NaHS administration, significant increases of IL-1β and MUC5B, as well as increased tendencies of TNFα and MUC1 expression, were observed (Fig. 4B). Four days after the administration, TNFα expression was maintained equal to or higher than that at 1 day (Fig. 4B). In contrast, IL-1β and MUC1 expressions were lesser than or equal to those at 1 day. MUC5B expression was returned to basal level 4 days after the administration of NaHS (Fig. 4B). Collectively, IL-1β, MUC1, and MUC5B expressions were peaked 1 days after the administration of NaHS, whilst TNFα expression was maintained or increased even 4 days after the administration. Significant increase of p-p65 levels in response to NaHS administration was also observed in A549 cells, suggesting inflammatory responses in NaHS-treated lung cells (Fig. 4C). It has also been reported that hydrogen sulfide directly activates NF-κB through sulfhydration of p65 (Sakurai et al., 1999). Thus, NaHS should activate NF-κB through enhancing both phosphorylation and sulfhydration. Moreover, administration of either TNFα or IL-1β resulted in significant increase of MUC1 and MUC5B gene expressions (Fig. 4D). Thus, upregulation of cytokine and mucin gene expressions observed in the rat lung in response to NaHS administration (i.p.) (Fig. 2D and Fig. 3A) should be the result of, at least in part, direct hydrogen sulfide toxicity on airway epithelial cells. In addition, NaHS should increase respiratory secretion, at least in part, through NF-κB-TNFα/IL-1β-MUC1/5B pathway. Activation of NF-κB and expression of cytokines as well as mucins in A549 cells administered NaHS. (A) Percentages of LDH released from A549 cells into the medium 4 days after the administration of 1 mM NaHS. (B) Increased expression of inflammatory cytokine and mucin genes in NaHS (1 mM)-administered A549 cells. Relative levels of TNFα, IL-1β, MUC1, and MUC5B to GAPDH are shown. n = 4 in each group. *; p < 0.05 versus -NaHS. (C) Immunoblot analysis of Ser583 phophorylated p65 subunit of NF-κB (p-p65) in A549 cells administered 1 mM NaHS. Relative levels of p-p65 to actin are shown. n = 3-4 in each group. *; p < 0.05 versus -NaHS. (D) Increased expression of MUC1 and MUC5B genes in A549 cells administered TNFα (50 ng/mL) or IL-1β (10 ng/mL). Relative levels of MUC1, and MUC5B to GAPDH (arbitrary units) are shown. n = 3-4 in each group. *; p < 0.05, **; p < 0.01 versus -TNFα -IL-1β. In this study we observed several pulmonary responses to systemic administration of NaHS in rats. Experiments using inhalation of H2S gas could be hazardous for researchers. Although intratracheal instillation is less risky than inhalation, there are problems that gases do not distribute homogenously in the respiratory tract and might not penetrate into bronchioles as well as into the alveolar region (Driscoll et al., 2000) and requires substantial level of skills. Our findings that bronchitis and respiratory secretion could be observed by simple i.p. administration of NaHS to rat should be beneficial information for researchers interested in respiratory secretions during H2S intoxication. This study was supported by MEXT KAKENHI (Grant Number 16K09203 to Ka.U. and Grant Number 17H04147 to T.A.). Adler, K.B., Tuvim, M.J. and Dickey, B.F. (2013): Regulated mucin secretion from airway epithelial cells. Front. Endocrinol. (Lausanne), 4, 129. Bhatia, M., Zhi, L., Zhang, H., Ng, S.W. and Moore, P.K. (2006): Role of substance P in hydrogen sulfide-induced pulmonary inflammation in mice. Am. J. Physiol. Lung Cell. Mol. Physiol., 291, L896-L904. Choi, S., Park, Y.S., Koga, T., Treloar, A. and Kim, K.C. (2011): TNF-α is a key regulator of MUC1, an anti-inflammatory molecule, during airway Pseudomonas aeruginosa infection. Am. J. Respir. Cell Mol. Biol., 44, 255-260. Doujaiji, B. and Al-Tawfiq, J.A. (2010): Hydrogen sulfide exposure in an adult male. Ann. Saudi Med., 30, 76-80. Driscoll, K.E., Costa, D.L., Hatch, G., Henderson, R., Oberdorster, G., Salem, H. and Schlesinger, R.B. (2000): Intratracheal instillation as an exposure technique for the evaluation of respiratory tract toxicity: uses and limitations. Toxicol. Sci., 55, 24-35. Fahy, J.V. and Dickey, B.F. (2010): Airway mucus function and dysfunction. N. Engl. J. Med., 363, 2233-2247. 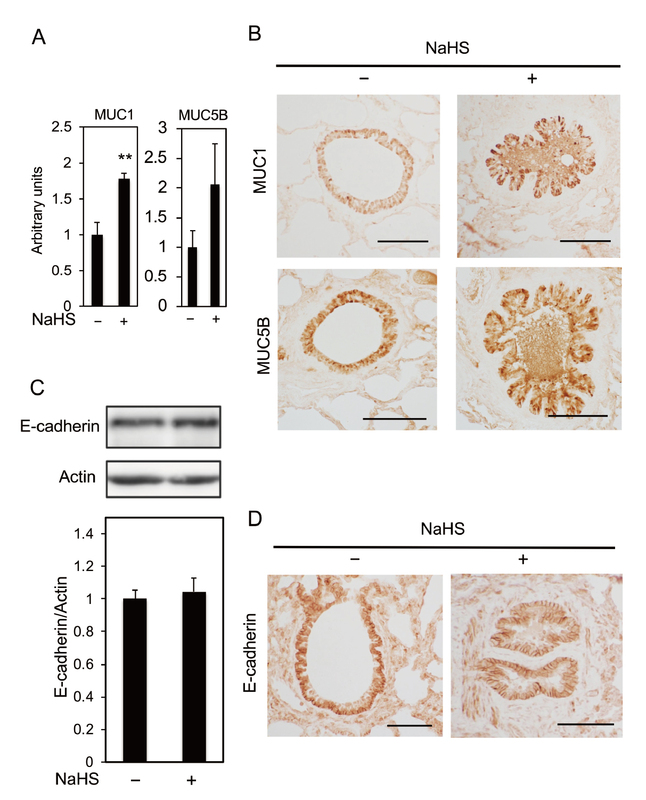 Fujii, Y., Funakoshi, T., Unuma, K., Noritake, K., Aki, T. and Uemura, K. (2016): Hydrogen sulfide donor NaHS induces death of alveolar epithelial L2 cells that is associated with cellular shrinkage, transgelin expression and myosin phosphorylation. J. Toxicol. Sci., 41, 645-654. Fujisawa, T., Chang, M.M., Velichko, S., Thai, P., Hung, L.Y., Huang, F., Phuong, N., Chen, Y. and Wu, R. (2011): NF-κB mediates IL-1β- and IL-17A-induced MUC5B expression in airway epithelial cells. Am. J. Respir. Cell Mol. Biol., 45, 246-252. Jeffery, P.K. and Li, D. (1997): Airway mucosa: secretory cells, mucus and mucin genes. Eur. Respir. J., 10, 1655-1662. Jiang, J., Chan, A., Ali, S., Saha, A., Haushalter, K.J., Lam, W.L., Glasheen, M., Parker, J., Brenner, M., Mahon, S.B., Patel, H.H., Ambasudhan, R., Lipton, S.A., Pilz, R.B. and Boss, G.R. (2016): Hydrogen Sulfide--Mechanisms of Toxicity and Development of an Antidote. Sci. Rep., 6, 20831. Johnson, D.C. (2011): Airway mucus function and dysfunction. N. Engl. J. Med., 364, 978; author reply, 978. Li, L., Whiteman, M., Guan, Y.Y., Neo, K.L., Cheng, Y., Lee, S.W., Zhao, Y., Baskar, R., Tan, C.H. and Moore, P.K. (2008): Characterization of a novel, water-soluble hydrogen sulfide-releasing molecule (GYY4137): new insights into the biology of hydrogen sulfide. Circulation, 117, 2351-2360. Mooyaart, E.A., Gelderman, E.L., Nijsten, M.W., de Vos, R., Hirner, J.M., de Lange, D.W., Leuvenink, H.D. and van den Bergh, W.M. (2016): Outcome after hydrogen sulphide intoxication. Resuscitation, 103, 1-6. Nicholls, P., Marshall, D.C., Cooper, C.E. and Wilson, M.T. (2013): Sulfide inhibition of and metabolism by cytochrome c oxidase. Biochem. Soc. Trans., 41, 1312-1316. Okawa, S., Unuma, K., Yamada, A., Aki, T. and Uemura, K. (2015): Lipopolysaccharide induces expression of collagen VI in the rat lung. J. Toxicol. Pathol., 28, 37-41. Reiffenstein, R.J., Hulbert, W.C. and Roth, S.H. (1992): Toxicology of hydrogen sulfide. Annu. Rev. Pharmacol. Toxicol., 32, 109-134. Rogers, D.F. (2007): Physiology of airway mucus secretion and pathophysiology of hypersecretion. Respir. Care, 52, 1134-1146; discussion 1146-1139. Rose, M.C. and Voynow, J.A. (2006): Respiratory tract mucin genes and mucin glycoproteins in health and disease. Physiol. Rev., 86, 245-278. Roy, M.G., Livraghi-Butrico, A., Fletcher, A.A., McElwee, M.M., Evans, S.E., Boerner, R.M., Alexander, S.N., Bellinghausen, L.K., Song, A.S., Petrova, Y.M., Tuvim, M.J., Adachi, R., Romo, I., Bordt, A.S., Bowden, M.G., Sisson, J.H., Woodruff, P.G., Thornton, D.J., Rousseau, K., De la Garza, M.M., Moghaddam, S.J., Karmouty-Quintana, H., Blackburn, M.R., Drouin, S.M., Davis, C.W., Terrell, K.A., Grubb, B.R., O’Neal, W.K., Flores, S.C., Cota-Gomez, A., Lozupone, C.A., Donnelly, J.M., Watson, A.M., Hennessy, C.E., Keith, R.C., Yang, I.V., Barthel, L., Henson, P.M., Janssen, W.J., Schwartz, D.A., Boucher, R.C., Dickey, B.F. and Evans, C.M. (2014): Muc5b is required for airway defence. Nature, 505, 412-416. Sakurai, H., Chiba, H., Miyoshi, H., Sugita, T. and Toriumi, W. (1999): IkappaB kinases phosphorylate NF-kappaB p65 subunit on serine 536 in the transactivation domain. J. Biol. Chem., 274, 30353-30356. Sonobe, T., Chenuel, B., Cooper, T.K. and Haouzi, P. (2015): Immediate and Long-Term Outcome of Acute H2S Intoxication Induced Coma in Unanesthetized Rats: Effects of Methylene Blue. PLoS One, 10, e0131340. Tanaka, S., Fujimoto, S., Tamagaki, Y., Wakayama, K., Shimada, K. and Yoshikawa, J. (1999): Bronchial injury and pulmonary edema caused by hydrogen sulfide poisoning. Am. J. Emerg. Med., 17, 427-429. Thornton, D.J., Rousseau, K. and McGuckin, M.A. (2008): Structure and function of the polymeric mucins in airways mucus. Annu. Rev. Physiol., 70, 459-486. Unuma, K., Aki, T., Matsuda, S., Funakoshi, T., Yoshida, K. and Uemura, K. (2013): Inducer of heme oxygenase-1 cobalt protoporphyrin accelerates autophagy and suppresses oxidative damages during lipopolysaccharide treatment in rat liver. Hepatol. Res., 43, 91-96. Unuma, K., Aki, T., Noritake, K., Funakoshi, T. and Uemura, K. (2017): A CO-releasing molecule prevents annexin A2 down-regulation and associated disorders in LPS-administered rat lung. Biochem. Biophys. Res. Commun., 487, 748-754. Wang, R. (2012): Physiological implications of hydrogen sulfide: a whiff exploration that blossomed. Physiol. Rev., 92, 791-896. Warenycia, M.W., Smith, K.A., Blashko, C.S., Kombian, S.B. and Reiffenstein, R.J. (1989): Monoamine oxidase inhibition as a sequel of hydrogen sulfide intoxication: increases in brain catecholamine and 5-hydroxytryptamine levels. Arch. Toxicol., 63, 131-136.